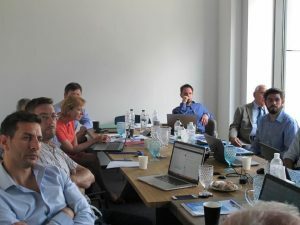 On July 11-12, 2018, GASVESSEL partner Vnipitransgaz held a technical meeting with the consortium members that work on the loading and unloading system for the intermodal transport system to connect onshore and offshore. The main topic of the meeting was Vnipitransgaz’s proposal on the structure and facilities of terminals for loading and unloading. Moreover, technical issues related to the parameters of compressor equipment, deployment options and technical parameters of gas storage facilities for loading and unloading terminals were discussed. 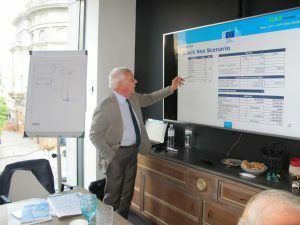 The meeting was attended by the GASVESSEL partners Navalprogetti, DOW Germany, CNG-V, CHC, cEnergy, ABS and Sintef Ocean. Additionally, representatives of NAK Naftogaz of Ukraine and BHGE-Nuovo Pignone, Italy, a company that can deliver equipment for the terminals, attended the meeting. 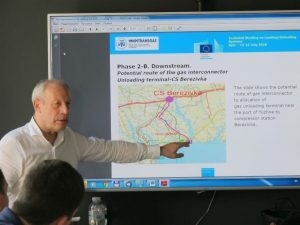 Borys Shvets of Vnipitransgaz, host of the meeting, presenting potential gas routes for the loading and unloading terminal. Oksana Pilatova of DOW giving her presentation at the technical meeting. 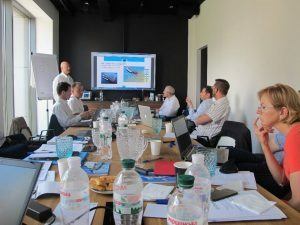 GASVESSEL partners Navalprogetti, DOW Germany, CNG-V, CHC, cEnergy, ABS and Sintef Ocean attended the meeting. Spartaco Angelini of Navalprogetti is giving his presentation on the GASVESSEL scenario for the Black Sea.